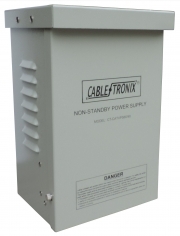 The CableTronix CT-CATVPS60/90 is a CATV power supply designed to provide conditioned power to remote active devices over a hardline CATV cable distribution plant. This unit is designed to work with either 120VAC or 220VAC input voltages with a 60VAC or 90VAC selectable output. The enclosure is built of durable, weather-resistant, powder coated aluminum for outdoor applications. It is able to withstand the harshest environments. The included installation kit allows the unit to be easily mounted on a flat vertical surface or on a wooden / concrete pole. The hardline power inserter is not included and is sold separately. Power supply for up to 10 CT-HDIPSS or 10 CT-HDIPCOM IP streamers, 12VDC, 8A, 96W Max. Pairs with CT-HDIP-10PK rack shelf (sold separately). DC Power supply, 24VDC, 2.08A Output, 100-240V 50/60Hz input, RoHS Compliant, perfect for use as the power supply for a SWM-32 single wire multiswitch (does not work as an LNB power supply in a SWM-32).